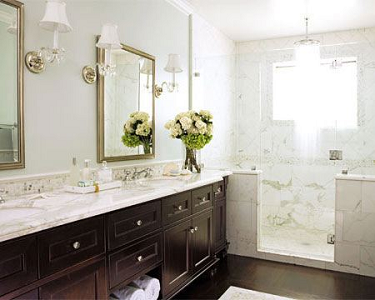 Bathroom Remodeling - My Home Company | My Home Company Inc.
It’s all about you and your own personal space. A place to start and end the day. A private retreat and a place to gather yourself and emerge renewed. 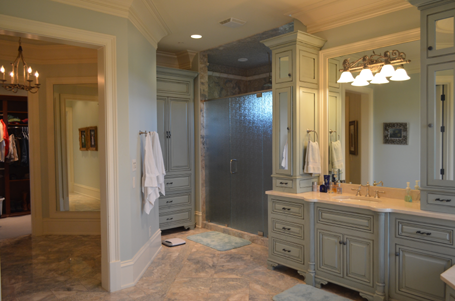 For most people, the Master Bath is much more than a collection of tub, shower, sink and toilet. A Master Bathroom is the one spot in the home to escape when you need to. It can be your place to unwind with a hot soak and perhaps a glass of wine and some music. 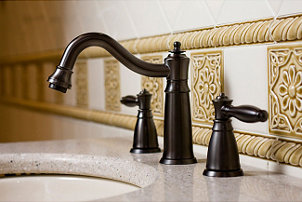 How nice would it be to use a sink that pours instead of splashes? A vanity that’s made up of beautifully appointed cabinetry where there’s a place for all your things and all your things in the right place. The master bathroom design should be just as much about function as inviting a relaxed mood. If it will be a shared space, then the design should allow each person equal, convenient access. Your ideal Master Bathroom Remodel may be a new measure of efficiency, a modern model of streamlined function where getting in, getting out and cleaning up is a breeze. Maybe you’d like to build-in other functions to the space such as a connected dressing area or laundry room nearby. It’s always a good idea to make mental or written notes as to how your bathroom is currently used and what you would change or include in your new bathroom. It’s a great idea to clip magazines and/or start a collection of pictures from the web that will help to define and inspire your ideal remodel design. Pictures really do speak a thousand words and go a long way in communicating your desires to us as builders. When clients come with photos and ideas, I know they’ve put some time and effort into what it is they’re looking to accomplish and it advances the project right from the start. How big of a space do we have to work with and are we considering expansion? How is the current bath space is connected to the bedroom and is that working? Will incorporating a Master Closet be part of the plan? Will any of the above considerations require relocation of the existing services? What activities aside from usual bathroom fare take place in this room? Do you prefer to take baths or will the shower be most utilized? Would you rather have more counter space or two vanity sinks? Are there any features currently in the bathroom that you would like to remove? Are there enough electrical outlets to suit your needs? Which areas will need better lighting? What types of storage do you want/need? Will the remodel cater to one or more seniors? What will the impact on material choices be when considering maintenance of the new bath? Are there any special things you want to include in the new bath like a towel warmer, dramatic shower fixture or skylights for instance? What style of bath are you considering? Traditional, modern or funky-eclectic maybe? It’s a great idea if you haven’t already done so, to check out sites like Houzz.com, thisoldhouse.com or search through any of the many magazines that display home design such as San Diego Home and Garden to be inspired and to get a better idea of the type of design that most appeals to you. A more Spacious Shower. Today’s showers can include all kinds of features such as body sprays, rain shower heads, hand showers, multiple shower heads, seats, and infinity drains. A walk-in (or roll-in) shower with no curb can be the right choice for folks of all ages. Some are choosing to locate the shower and tub in a shared space by placing a freestanding tub in the center of the shower zone. If given the right dimension, the tub can “float’ within the space and creates a more dramatic effect of openness. Though large tubs are optional in a master bath, if it’s one of your must haves you may consider today’s effervescent tubs and those featuring heated air jets that emit warmth and bubbles which are an increasingly popular choice versus the water-jet Jacuzzi types. Still a standard and always popular, basic bath tubs are a “greener” way to go and are less likely to be positioned in a corner where they take up valuable square footage. Standard tubs are smaller but can still be large enough for two. Privacy for each of you; having the loo behind closed doors within the master bath gives everyone more privacy, especially when the space will be used by two at the same time. Ventilation and lighting are key in this closed off space, and it’s nice to install a dedicated vanity with storage if possible. Dual sink vanities can gain a measure of privacy when a shelving unit or pony-wall is positioned between the sinks. It’s the kid’s bath, it’s the overnight guest’s bath and for homes without a master bathroom, the Family Bathroom is where all the action happens. It can be a high-traffic space, and for this reason, functionality is paramount. Typically, these bathrooms that get the heaviest use will need to combine a good design with a beautiful appearance and maintenance friendly choices. The bathroom should work for everyone and that’s a tall order. Designed around utility, the idea is to get in, do your thing, and get out. But this “keeping it simple” basic theme doesn’t mean the space has to be boring. Interesting tile work, updated fixtures, an ornate mirror or decorative light fixture can dress up this space and create a bath you’ll be proud of for both family and guests. As you begin to form some idea as to what you want, take some time to consider your family’s lifestyle and how the bathroom is utilized on a daily basis. Consider how you’re using it now and what you want the remodel to accomplish once complete. How many people use the bathroom at one time? Do you need a bathtub in this space? If you choose to not include a tub, is there another bathroom in the house with a tub? Do you bathe children in this bathroom? Is toilet privacy a necessity? What appliances do you use, and are there enough electrical outlets available? Note – While many people are opting to remove the tub, most buyers generally want to see at least one bathroom with a full tub in the house. When it comes to remodeling your bathroom, kitchen or most other high-function areas of the home, the process of narrowing down the options can be overwhelming. You can’t typically afford to do it all and no matter how much luxury you build into the space, there’s always “just one more thing” you could add. That’s why taking the time to seriously review how you use the space and setting goals for your remodel will keep you on track as you make important decisions about floor plan, fixtures, surfaces and more. To know what’s possible within the confines of your current home’s structure and your budget, you’ll want to contact us and let us know what you’re considering so that we can assist you in creating a realistic plan that suits your needs. While you’re brainstorming ideas for your new bathroom, use the pictures you’ve collected to learn about various bathroom design layouts to gain inspiration. When clients have collected pictures and have given a fair amount of thought to their remodeling plans, it gives us as builders, direct insight as to what they are looking for and helps to convey what they’re envisioning. It makes for a much better design when those who will actually use the space, have had the greatest amount of input. Make sure to express your desires and expectations to whichever remodeler you’re considering and see that they reflect those expectations in a written estimate and any agreements for work.